Robert M. Pursig? There’s no Zen involved, just sweat, cursing, oil and more sweat! I spent the better part of this morning into the afternoon installing an in-line screw on oil filter. 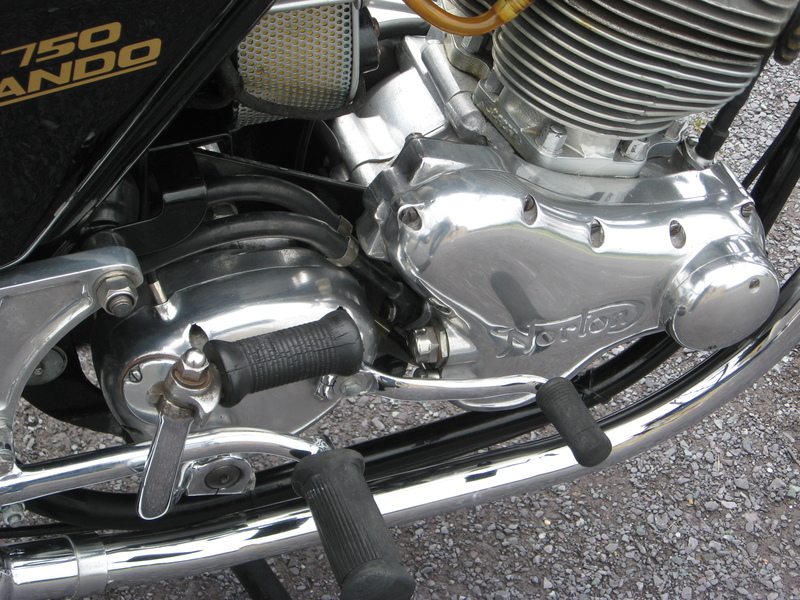 It entailed draining the frame ‘tank’ then checking the mesh filter and assembling the C-Clamp attached bracket into a very small space under the rear swing-arm. 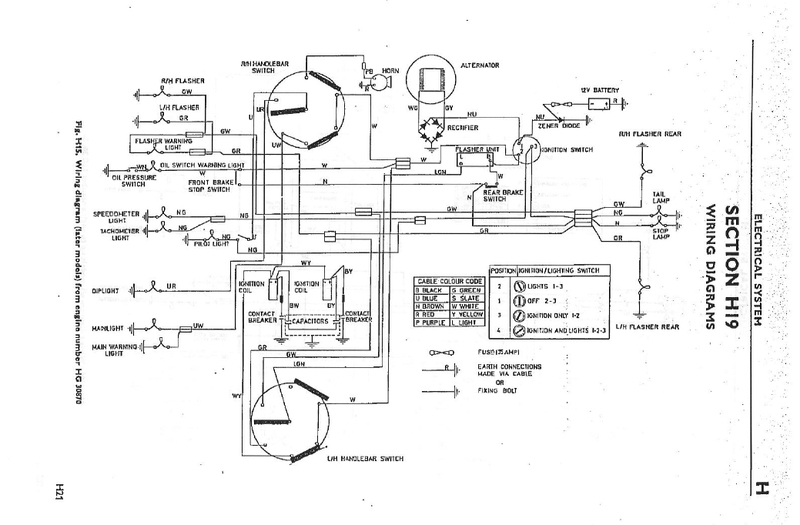 Reconnecting oil lines became problematic with different sized hoses: 5/16″ ID into 1/4″ ID adapters anyone? All this was carried out in the storage garage under the office, warm, steamy, filthy floor. I was a true wet, oily, mucky mess! Nothing a good shower, swim then shower at the Y couldn’t amend! Well it’s on now so I can keep the oil clean for the engine! 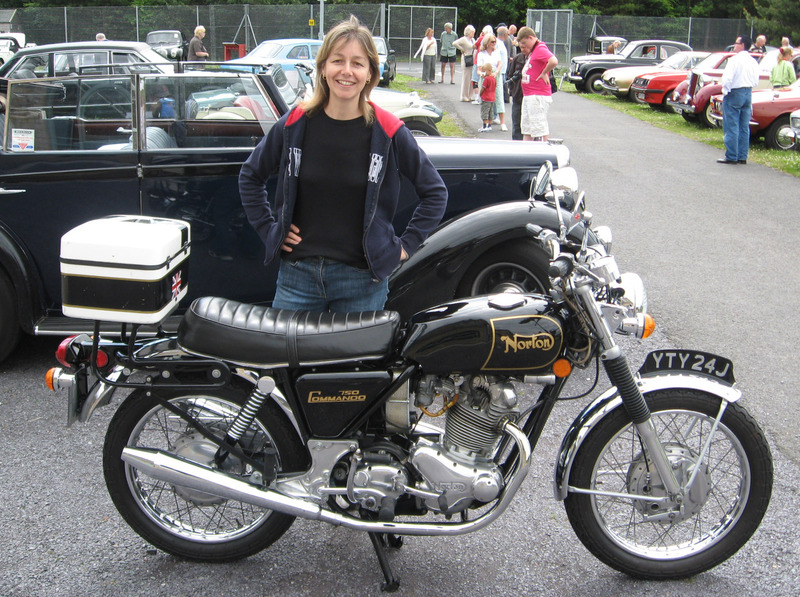 This chap has certainly got a Tiger by the tail; it’s a late 70’s LH shift single carb 750cc Triumph Tiger. That crazed look is familiar! 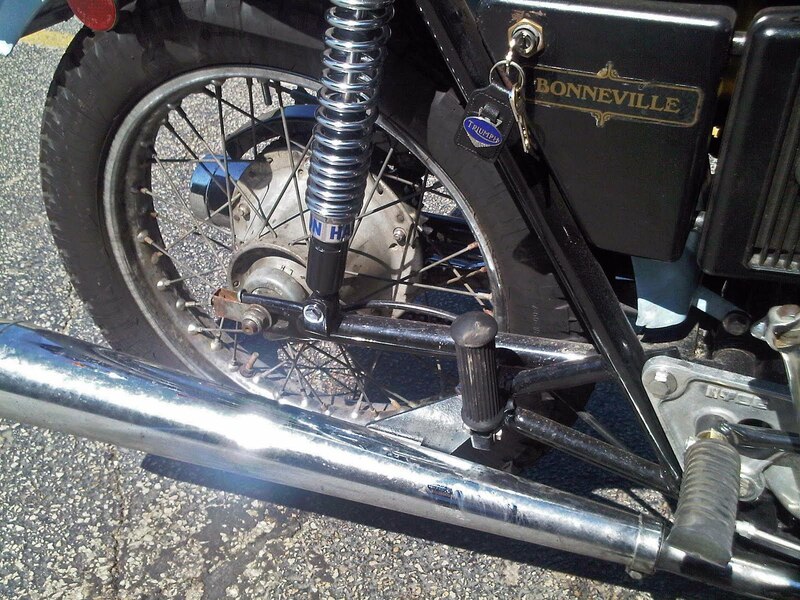 Beautiful weather on this Saturday morning saw the bike taken up along the shady swoops of Sheridan Road; delicious. New rear shocs are a smooth treat over rough spots. 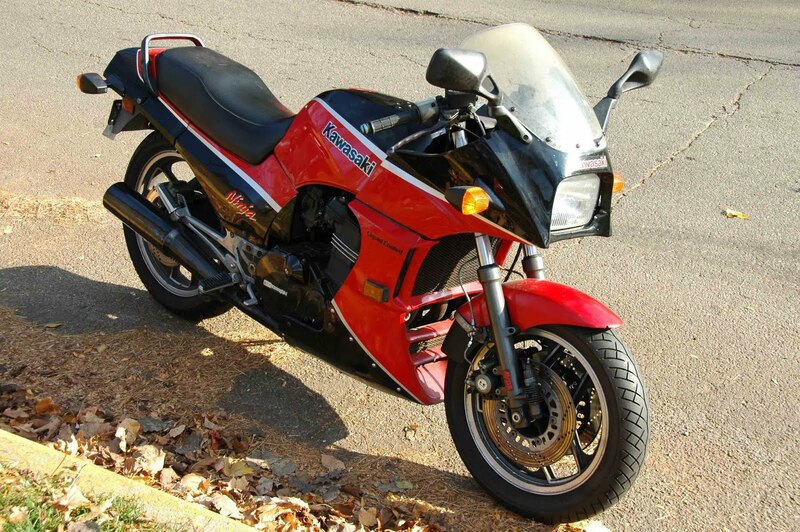 When the Ninja 900 (ZX900A, GPZ900R) came out in ’84 it caused a stir in the motorcycle world; lightweight, narrow, strong as a horse (or 105 of them!) and sporty lookin’ too! Here’s the ’85 I owned for a few years, great bike with heaps of old world power. Although just running in the ‘States for a few years it lasted in Europe and Japan for over a decade surpassing two other successive models. 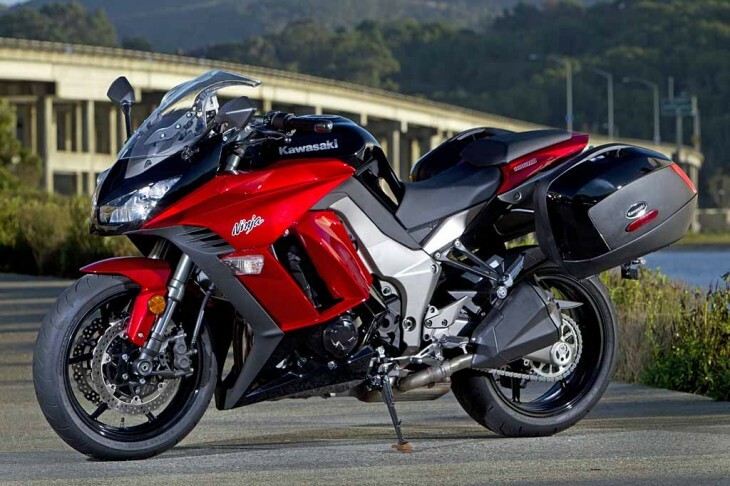 Well, Kawasaki has a new Ninja in their stable, less race honed but more everyday riding intended. Offering fast fun, far fun, fabulous fun! It’s 1000cc engine a perfect blend of useability, yet turn it on and it growls. And, at $11,000 darn good value for money in relation to other offerings. The new is the new, new! 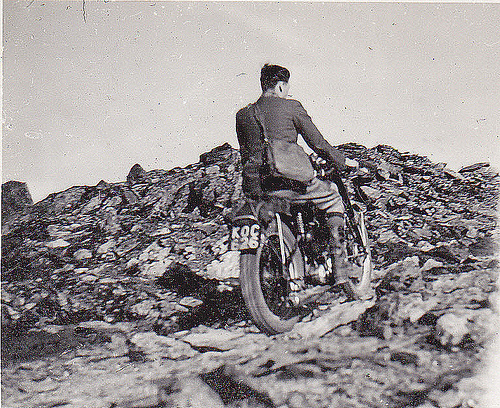 Here’s Joe Brown, hard mountain man of the 50’s and 60’s, riding what looks like a Speed Twin up Snowdon in North Wales. Well it’s one way to get to the craggy Cloggy over on the north side! 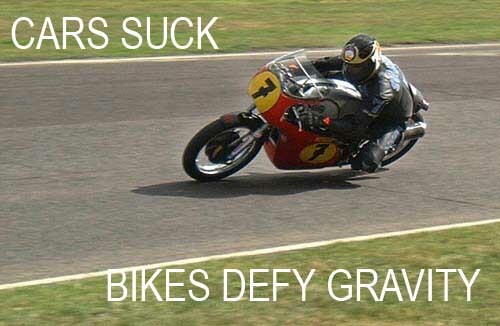 Our Hero Baz haring around the Goodwood tracks on a vintage Norton; adorned with his No. 7! Pure Majesty! …the red wire, no the blue wire, no the blue wire with white stripe, no the…. 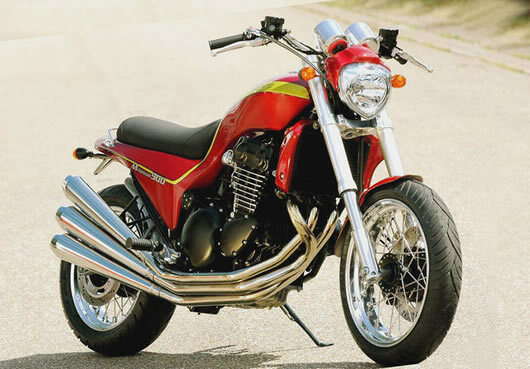 The Iconic X75, restyled Trident by Craig Vetter in the early 70’s was meant to be the shot of styling adrenaline the company needed to unseat it from the shoals of economic strife. However it was not to be relating to various mismanagement politics; however it’s still a powerful look for the very capable triple. Here one Jean François Vicente has taken a late 90’s Hinckley Adventurer and graced it with the vetteresque bodywork, the striking orange and yellow colours, hefty upside-down forks, modern roadgoing tyres and three upswept pipes. Spiffy! Growing up in North Northumberland one of the highlights of late summer was the annual arrival for two weeks of the ‘shows’. A small travelling fairground called Slaters. 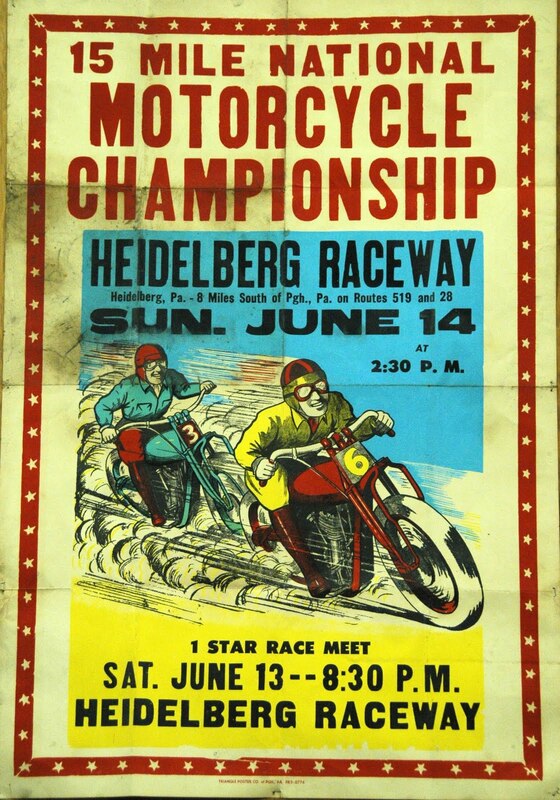 Among the shuggy boats, ‘big’ wheel, and octopus rides as well as the gaping mouth clowns and pingpong goldfish bowl arcade was the “Speedway” ride. a rolling carousel of bikes and chairs. It was, for a 7 year old, the first effects of speed and centrigugal forces sitting atop a ‘motorbike’ although it was fixed! 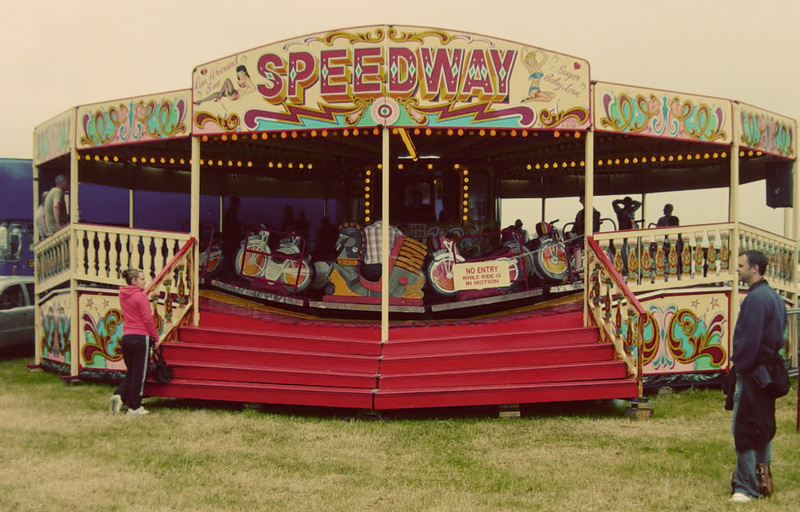 Ahh, the heady smell of candy-floss, diesel and trampled summer-dry grass; backed by flashing lights, 70’s disco music and whirring machinery. 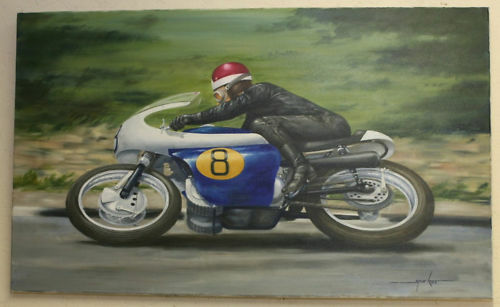 An evocative painting of Percy Tait aboard a racing Triumph in the late 60’s. 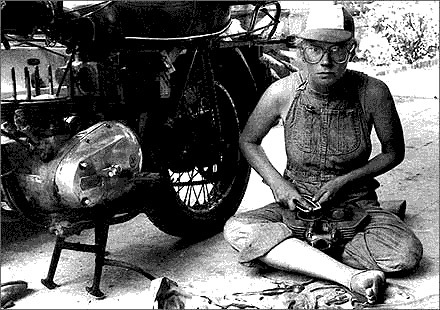 One time Triumph road tester he also raced the bikes; including Slippery Sam, which gained its name when the oil pump spewed Percy’s boot with the black stuff at a Bol d’Or 24 hour race. Percy was at the very sharp end of Triumph testing in the sixties especially the powerful triples racking up an estimated million miles around the roads and racetracks of the UK for Triumph. The latest offering from the bespoke french garage Blitz is a reworked 2001 Kawasaki W650, the more lookalike Bonneville lookalike before the latest Triumph T100 came out. 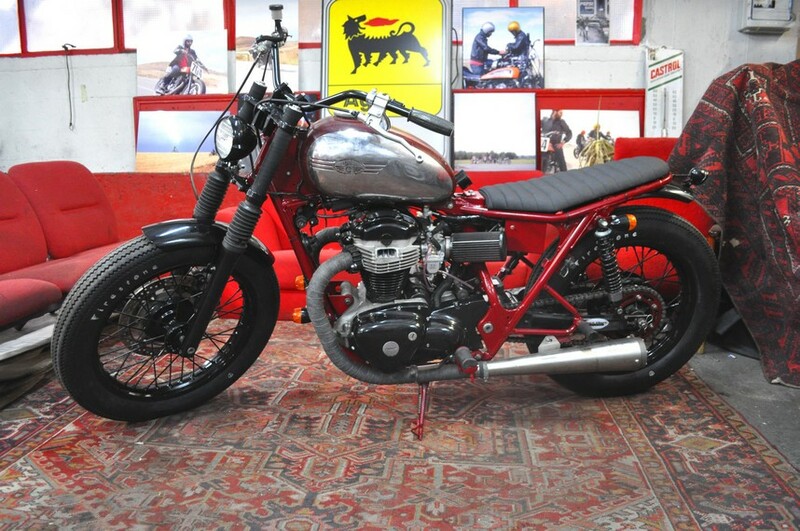 They have given it a somewhat bobbed-jobbed-cobbled-robbed-knobbed unique appearance with crimson frame, heavy balloon firestones and an old Jawa tank itself complete with aged patina. Probably a very enjoyable ride with a roadster laid-back stance and wide bars but with a very subjective aesthetic taste! 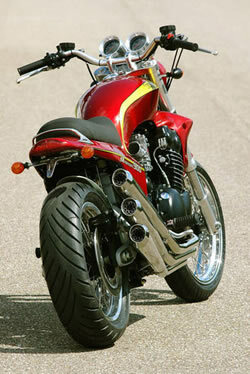 Also paraded today on BikeExif: http://www.bikeexif.com/kawasaki-w650#disqus_thread with plenty of diverse comments. 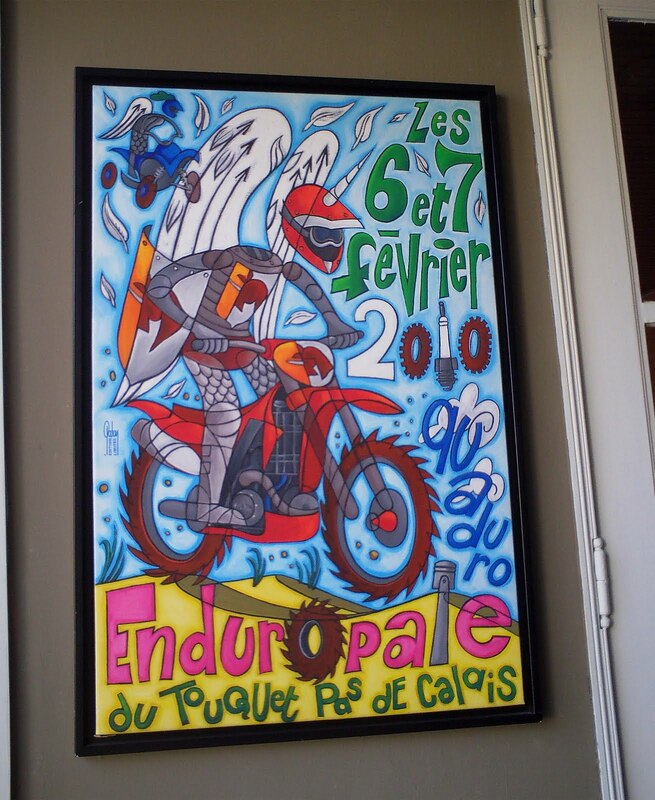 A photo of an Enduro event at the Pas de Calais in France my nephew Dan captured during a school trip there. A winged knight atop a buzzsaw wheeled moto. Great expressive imagery. 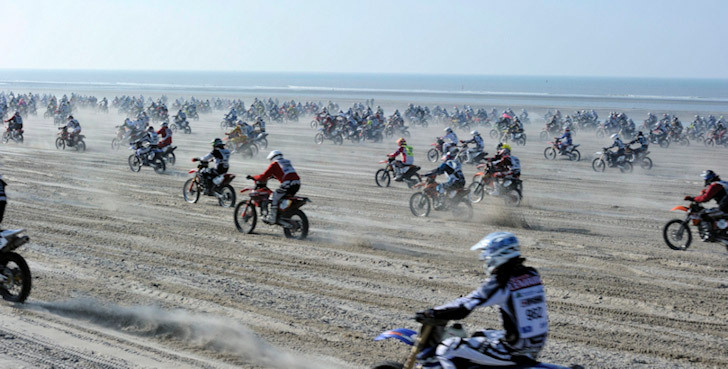 The event is a ‘free for all’ race around the beach dunes on the Channel coastline. Nice little orange framed number! 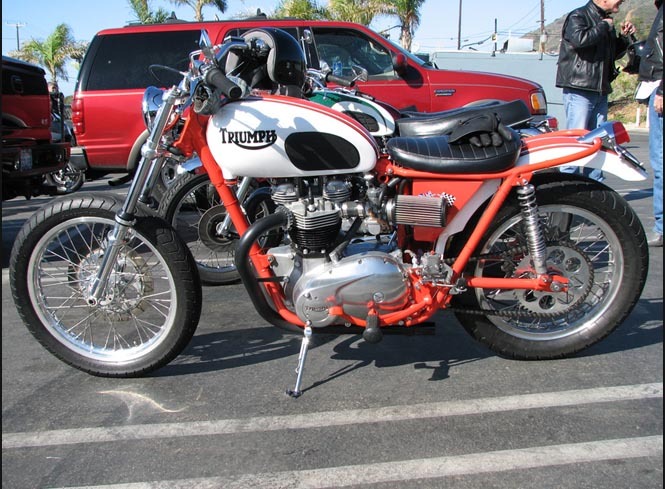 A serious consideration with any future build would be the colour of the frame: here someone has taken their late 60’s Bonneville and given it the fiery orange treatment with white tank. A nice combination! 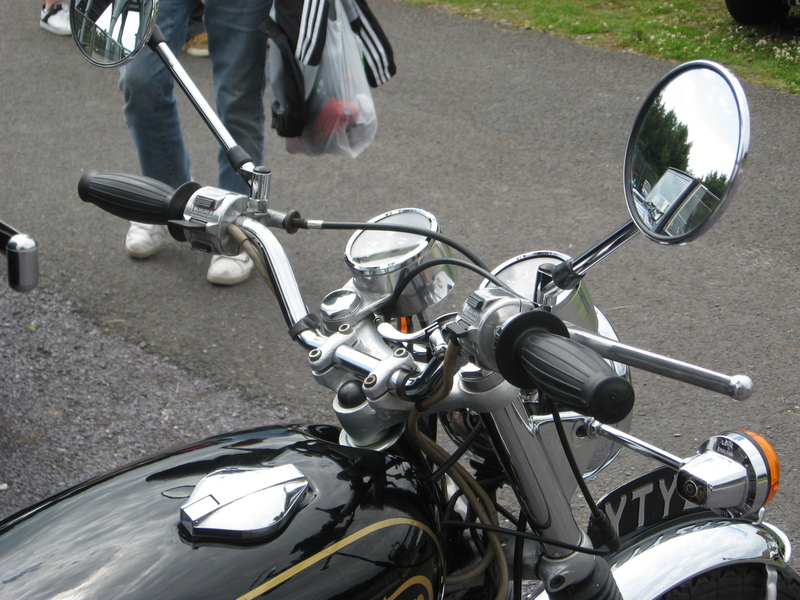 TT pipes in matt black, shallow lamp, fenderless front with disc brake, more up-to-date carbs and big airfilters, ‘stubby’ seat and modern tyres. 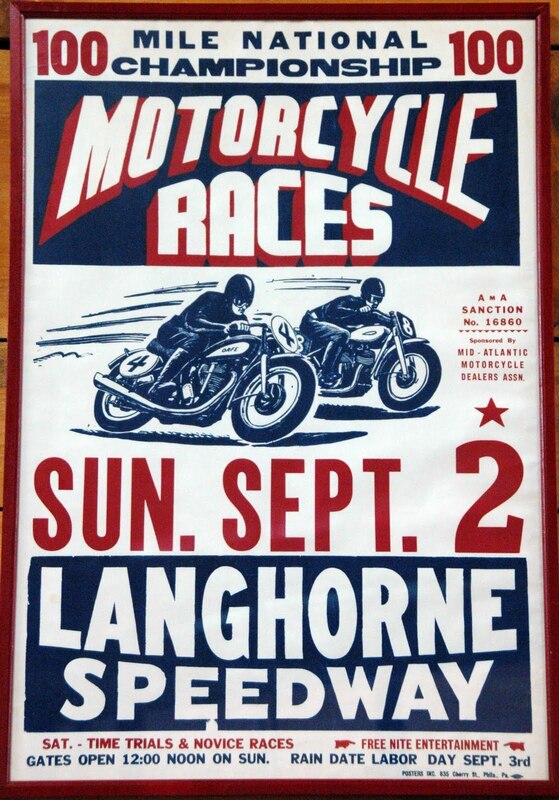 This is certainly a riders ‘flat-track’ machine. Well I wouldn’t say no if you offered it to me! 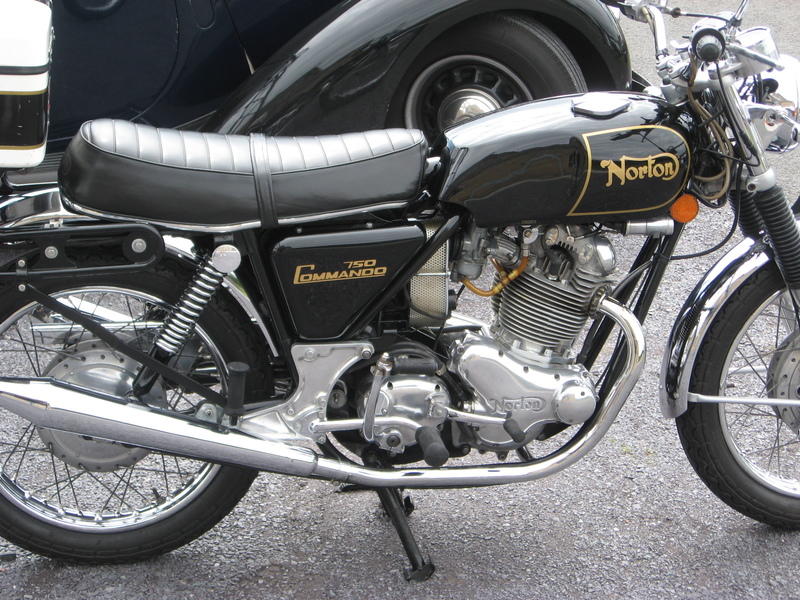 My sister, Ruth, found this ultra clean example of a Norton Commando 750. Super sharp details and nice polished finish. The top box reflects a user who rides for a purpose, though obviously only on good days! 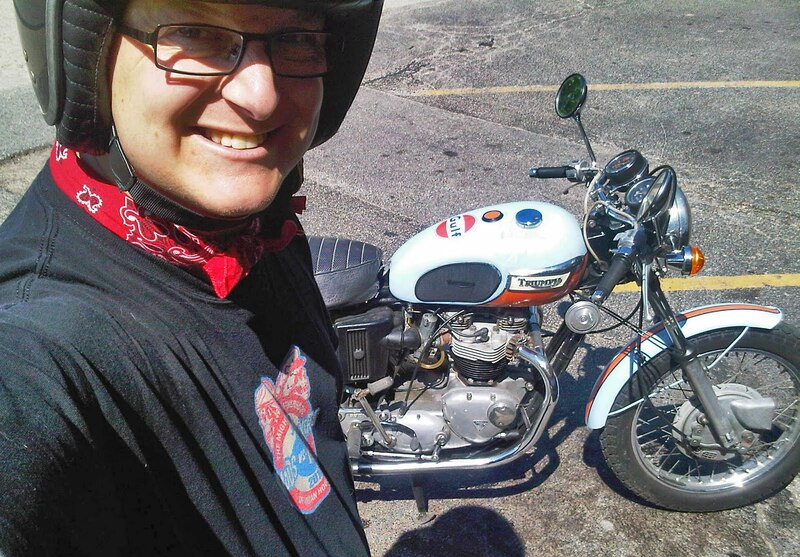 A ride sitting out in the sun, where it should be, looking road weary; it certainly should be after the thousands on miles from its ride across the US in the Cannonball Run last year. 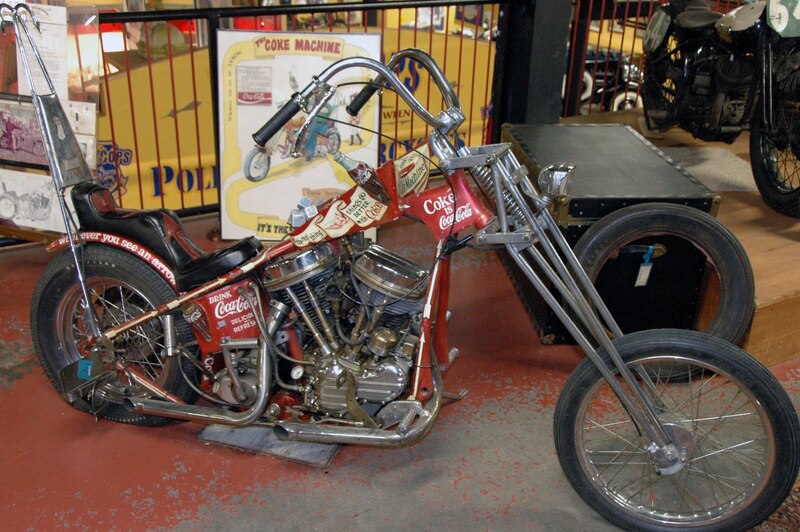 Bikes had to be older than 1920 to run. Dedicated bikers indeed! 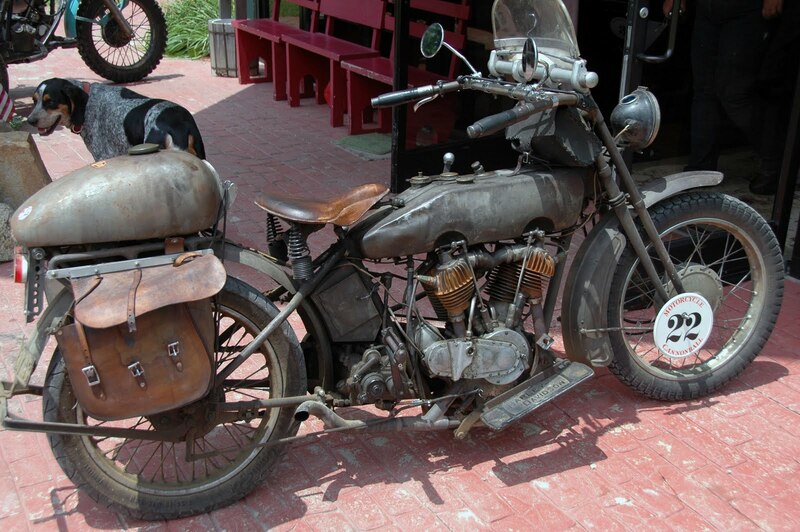 This was Dave Walkslers 1915 Harley Davidson, he came in 11th after 3292 memorable miles.